One of the most exciting features of the Nintendo Switch is the fact that it's now region free, a welcome progression for a Nintendo home console. While it's a much-lauded feature, like most publishers Nintendo won't be publishing any tutorials on how to do this any time soon, so we here at Nintendo Life have decided to help you out. After all, there are quite a few Japan-exclusive launch titles for the time being. So if you'd like to join us in downloading Dragon Quest Heroes I & II, we humbly present the following guide to get you started. 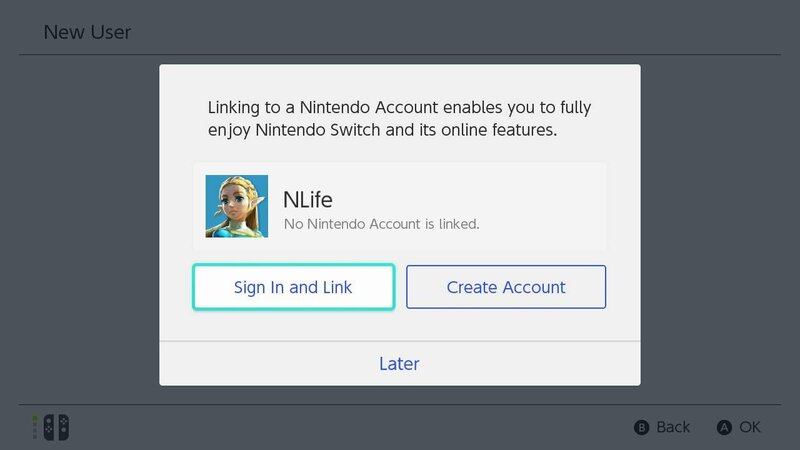 In your browser of choice, head over to accounts.nintendo.com and choose to sign up for a new account. then enter your date of birth on the following screen. Next, you'll fill out your details like Nickname, Email address and password. Two key points here - first off, you need to use a different email address from your 'main' Nintendo account. 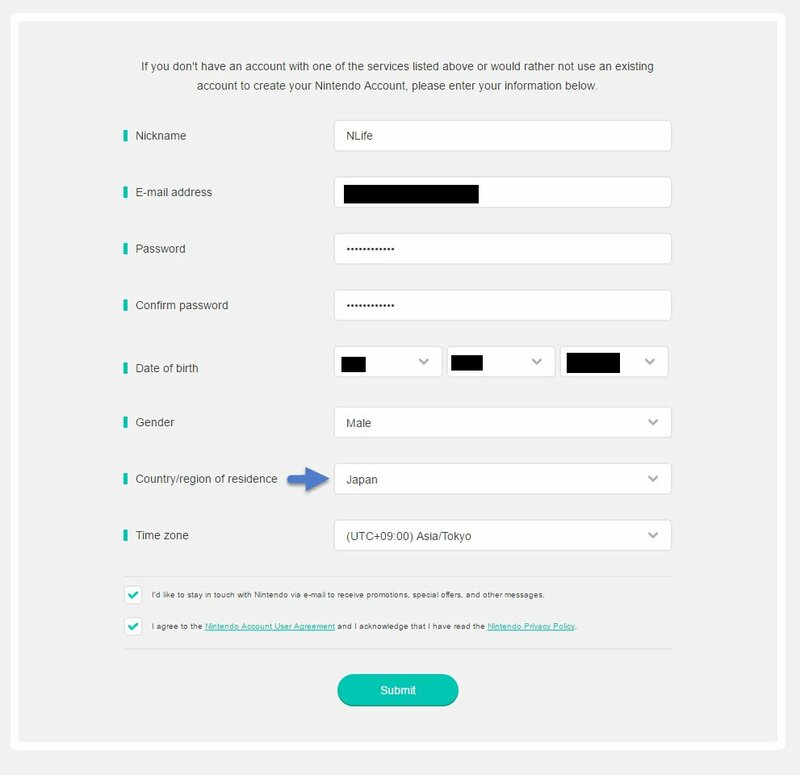 This second account needs to be unique, so you'll need to ensure you not only have a second email address, but also easy access to it. Secondly, and this is the most important part - under country of residence, make sure you select Japan. This setting determines your eShop region. 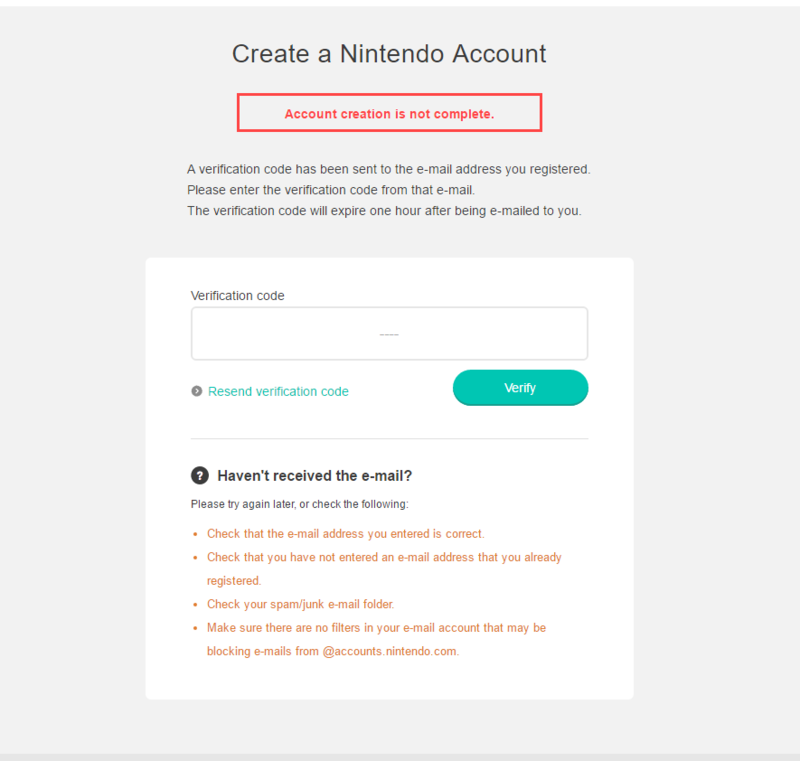 After that, you'll receive an email from Nintendo (to the relevant email address) containing a four-digit code. Enter the code you received on the page and click verify. If you entered the code correctly, congratulations! You've just created a Japanese Nintendo Account. From here on you'll need your Switch. First, click the gear icon on the bottom of the home screen to go to settings. Once you're there you need to select Users, then click "Add User." After you click Sign In and Link, enter your Japanese Nintendo Account credentials you created earlier. Once you've done this, you're ready to start perusing the Japanese eShop! When you click the eShop icon, you'll be asked who is using the eShop. If you want to view your local eShop, use that original account, if you want to see Japan's offerings, choose your new account instead. That's about it. So, will you be doing any digital importing on your shiny new Nintendo Switch once it arrives? If so, which games do you plan on downloading? If not, why not? Let's talk about it. Let us know in the comments below, and happy importing! If I'm not mistaken, I think you can just change your region on your main account and get to their eshop. Seems a little more complicated than it should be, but having the option to have region free eShop options is great nonetheless! So happy about this! I wonder if in the future they'll add the capability to easily choose which eShop you'd like to peruse so people don't have to do this. @Xaessya I haven't tested that, but wouldn't recommend it. Plus, this approach allows you to switch which eshop you're looking at without going to Nintendo's site. This is the exact same process you follow for PS4... I know cause I've done it and have a 2nd Hong Kong account for English Asian games. The Vita... now that's unnecessarily complicated. You pretty much have to ghost your system every time, so most people don't even bother with the PSN. Just import physical copies. @JaxonH Yep, you could do this on the PSP and XBox 360, too. But it's good to see Nintendo catch up. Also, do we know if eShop "gift cards" are region free (E.G. if you buy a plastic $20 eShop card in a US retail store, can you add it to your Japanese wallet? Oh wow, I honestly didn't know this! I thought it'd still be locked! I hope Nintendo implements an "import-friendly" category in the Japanese eShop. If a title like, say, Darius (which doesn't have much text at all) has its menu options in English, might as well put it there and let people from all over the world access it. Even things like Ace Attorney, which, if I'm not mistaken, are only translated into English could be placed there. Do you have to be on the JP account to PLAY the JP games? @Moi Most likely since the account is treated as a separate account from your main account. You probably have to swap accounts when you want to play something from another eShop. Shouldn't be an issue for physical imports though. Easy and straight forward, unlike certain other services (yes, I'm talking to you, iTunes). That's great, this is a PSP/PS3 feature that I always wanted to do on the 3DS, Wii, and Wii U. Finally Nintendo had catch up to the competition. @NEStalgia I've used the Japanese eShop on the 3DS several times, and that was very happy to accept my UK Visa Debit Card details. The currency converted price was taken from my bank account and... well, that was it. There might be extra charges from purchasing in a foreign currency, but if there were they weren't very large. I assume the Switch will be the same. I don't have a list of accepted cards, but if my completely unremarkable UK Santander Visa worked, I imagine most will. As for the eShop cards, I find it hard imagining a $20 eShop voucher converting into anything other than $20, but stranger things have happened. So you can buy games from any region's eshop at the price in that region. Meaning that in theory you could purchase games at lower prices if they cost less in a particular region and the weak value of the pound doesn't offset it. Can someone here compile a list of what is available in each region (including demos)? It's a lot of work to do this just to find out what exists over there, it'd be convenient if someone just made a list. If they included what languages each game included, even better! While cool... I really just want to know when the NA or EUR release of dragon quest heroes is happening. only problem is, what if I can read Japanese? do some Japanese only games get translated to English but never come to America? @derty Some games get Asian releases in English... or the company is weird and puts in a language option but doesn't take it outside of Japan like Capcom and the first three AA games. I am a little annoyed that you need two different email addresses(tried earlier once I found out the shops could be accessed for multiple regions). I have two different email accounts but I was able to make my NNID's with one before. Ah well I don't to buy more than one switch. That is all I care about. Gonna load up on demos tomorrow. @Maxz Thanks, that's good to know! @Ryu_Niiyama Most things require a unique email address by account though, so it was pretty weird that NNID's didn't require that. I had 3 on one email address (created due to the odd limitations of 2 3DS's per account, and I had a few as new versions came out and didn't do system transfers on the old one if I kept it). But I think it's overall a good thing to prevent users with too many aliases from behaving badly online if it's tied to an actual email. People were creating dozens of accounts before. Shouldn't be too hard to get disposable gmail accounts and such though. This lil trick saved me from staring at my useless switch all night. Why not give away AT LEAST a couple of demos for Europe like in Japan, Nintendo ? Whyyyy ??? @NEStalgia Like I said it is a minor annoyance and I have multiple emails. I just liked having a personal email and a gaming/fanfiction/nerd email so I could keep things separate. Not sure if I am going to make another email addy just for my switch though. I'll think about it. Edit: I live on eshop cards If I don't buy retail. I never put my CC info. What demos are available in NA? You still need to know Japanese when downloading a game from the Japanese eShop. As the "specific" games only available in Japan will only support the Japanese language. @PGS_71 The difference would have to be noticeable though. Most credit cards charge an additional conversion fee when you buy stuff from a region with a different currency. You'd also need to find a region that supports a language that you would understand as well. From my experience not many people actually import games on the Xbone or the PS4 compared to just purchasing in their own regions. That Japanese VC / Arcade Archives just got sweeter looking. Will the Japanese eShop feature English text if your system language is set to English? Right, all set up. Used the NNID from my JP 3DS to create a new Nintendo Account, although had to change the email linked to said NNID in order not to clash with my UK NNID, which I used to set up my UK Account. All in all, it might have just been easier to create the JP Nintendo Account using that different email to begin with, but these seemed neater. Possibly slightly pointless if the NNIDs are going to be scrapped, but still. The two email thing is probably the most fiddly bit, if understandable. I mean, I've got a couple of emails addresses that are linked, so send all their messages to the same place, but it's definitely easier just dealing with one. Nice!! It doesn't require you to register a false or an illegal address located in the other country like the PlayStation Network does! @CB85 There is a good reason why a "specific" game is only available in Japan. It means it's not localized yet and thus only support Japanese Language and text. I have yet to see a Japanese region game with supported english text, unless it was a game originally developed in NA or Europe, but then we wouldn't have this conversation. This is pretty cool. Once it's setup, it's easy to switch (pun not intended). Good going Nintendo! @Jeronan Yes I know that, but I was specifically asking if the eShop itself would be in English, obviously Japanese games would be in Japanese. @Peterjr1 No. This just makes it easier for people that play Japanese games to do so. No other official way to translate a game aside from localization...which would mean you wouldn't need the Japanese version anyway. You may get lucky with global releases (like with Zelda for instance) but again you would just buy the game in your region then. Created my new JP Nintendo Account! 😃. So just to be clear, I won't ever need to create a JP NNID in the future, to access the JP eShop/play my JP games that I've downloaded from the JP eShop, correct? My current/main, US NNID that I've had for the past 3+ years, is all I'll ever need, right? @Ryu_Niiyama 100% agreed with not using the CC. Nintendo is one of the few things other than select retailers and some bills I have to pay with CC that I actually have used it. I've been debating whether or not to continue with the transition to Switch or to go with cards. I think Nintendo security has been better than most (grrr, Sony, that was the last time Sony ever gets a real CC!) Haven't ruled out Gamestop as the culprit either (used gift cards or PayPal ever since) ) but with Switch who knows if the online infrastructure is outsourced (probably is) this time, so I'm somewhat inclined not to trust it. If you try your cards on the JP eshop tomorrow, let me know how it goes! I could be wrong, but I believe that's how it works. Awesome. I wasn't expecting this to be possible, so it's great to see it actually happen. Do you have to use the account you get the games on? @NEStalgia Hopefully that's the case. I have two Nintendo Accounts. My main US one, and now a JP one. I have one NNID, and would prefer to not have to deal with multiple NNID's. What's funny is, I was logged into my US My Nintendo Account, and when I clicked the My Nintendo tab in my JP Nintendo Account, it automatically created a JP My Nintendo Account. There, it gave me 100 platinum coins, 30 sign in bonus, 30 sign in bonus (weekly), and it made me by a points jar for 50 platinum coins. I guess that means whenever I buy games from the JP eShop on my Switch, I'll still receive gold coins to my JP My Nintendo Account. Pretty neat! @Ernest_The_Crab This is true, but the the non-native conversion fee will vary between cards (in some cases being zero), and I'd wager practically all games I would still come out cheaper paying the charge than paying for import costs etc., and Japan's favourable pricing for games can actually still make this cheaper than buying from your own store (depending on your region). To give an example, I downloaded the JPN version of the Phoenix Wright: Ace Attorney Trilogy last month, which had a face value of ¥2,990. Google tells me converts to £21.37. The amount charged to my account on the date of purchase is £21.51 (which is in line with the conversion rate on said day), plus a £1.25 non-sterling charge, bringing the total to £22.76. For reference, the same game (in its discount 'Best Price' box) has a base price of £28.93 on play-asia, which is before including shipping (which ranges from £4.88 [5-14 days] to £26.37 [3-5 days]). So if you somehow avoid import duty, you're paying (minimum) £33.81. Import duty itself has costed me around £22 on 3DS games in the past, so include that and you're over £55 for the same game. So in short, buying on the eShop - even with the conversion fee - is still about half the price (to the UK at least) of importing via play-asia, which is why having Switch eShop access is a pretty big deal. What's more, the Japanese Version of Ace Attorney Trilogy happens to also come with all the English versions of the first three Ace Attorney games too, meaning that I actually managed to download the games in English (as well as Japanese) for £22.76 instead of the £24.99 price on the UK eShop. So not only is the Japanese eShop significantly cheaper and quicker than importing the Japanese, it might actually be cheaper than buying an equivalent game from your native eShop - even including the foreign transaction fee. I don't know how that compares with other parts of the world, but being based in the UK, global eShop access comes as fantastic news. @Xaessya nope, you need to have a Nintendo Account with the specific region. @Maxz For me it works out to be about $5 in savings before applicable taxes/additional credit charges. Then again the Canadian dollar hasn't been particularly good in recent times. Well, the States also seem to have a relatively low savings as well going by your original numbers. I guess pricing wise this only really benefits European countries? I'd probably only do the digital imports if its something that I feel wouldn't be released over here (or be horribly delayed). Yeah, it shouldn't be that convoluted. You should literally just be able to go into the eShop and pick the country to see and purchase games from that region. That's how simple it should be. All it needs is a little check that just reminds you when you're about to buy it what region it's for and to confirm you're cool with that, or something like that. It doesn't feel like real "region free" as complicated and convoluted as it currently is. @Steve_Bowling: Thanks for reacting so quickly! Me and others had questions about that in the comment section of another article, so it's nice to see that there already is a guide out there. Although the course of action seems to be almost identical to that one the Wii U (within your region). "When you click the eShop icon, you'll be asked who is using the eShop." That's actually a small but very convenient change in the navigation of the menu! This is cool, but, feels like, based on the friend codes debacle, that Nintendo will return to form and find a way to stop this. Check out this forum if you want to know what japanese games that have English. @impurekind it isn't complicated at all. When a game is installed by the account tied to the Japanese eShop can all of the users on the system access it, or do you have to switch users to play games from different regions? @impurekind Well, that only counts for people that feel they HAVE to go digital, for whatever reason. If you simply buy physical cartridges, you'll have no such problems. And the Switch can play cartridges from all regions with no problems whatsoever. On a related note: it has just now been reported that the Japanese versions of I Am Setsuna and Disgaea 5 Complete also contain an option to display English text, so people in Europe that don't want to wait until physical versions of those games will finally arrive on their shores, can import the Japanese versions now. Can anybody confirm whether the games appear in-line with your standard region games? Like will my Japanese downloadable next to my US downloads, or will I have two separate sections of games? I want it all together. It's great Nintendo currently allows for access to other regions' e-Shops. However, most modern systems require only soft(ware) modding, usually not any hard(ware) modding, to do exactly this. I think Nintendo touted this (feature) for marketing. Again, it's great they're allowing this, currently, but based on how to do this, it seems that it wasn't made as streamlined as it could have been. There must be a reason Nintendo designed the system, so you have to make another account, just to access a different e-Shop. I suppose it has something to do, with each account being locked-in to one region, monitoring which region gets the most titles' playtime out of users, &/or for monetary purposes. I would suspect, now that I think about it, monetary purposes. Grabbing Japanese virtual console games will now be a piece of cake. Thanks for the guide. Different account means different wallet. Thanks Nintendo! Seeing as the Switch is region free, it would be nice if we could now get the Japanese weekly update too. They might have offers that we don't have, etc. Can you add money to a JP account using a UK debit card? Anyway - what I really wanted to ask is - is Dragon Quest Heroes playable? Is it in English. I've only played DQ7 and if Heroes is anything like that then there's no point in me getting it in Japanese. Pro tip that I couldn't find in comments, sorry if someone talked about it before. If you use Gmail, you can create more than one Nintendo account centered in the same email address. Simply add dots among the user name (the part before @). Example: [email protected], you can use [email protected], all combination possible will redirect to the same username. @Moi My guess is no. Once the game is downloaded to the system it's there. Just how all users on WiiU can play all downloaded games. I don't think it would disappear from the Switch menu when accounts are switched. Is there a way of translating the text? My system automatically swaps to Japanese so I have no idea how to get the demo's. Is there a way to get the Japanese Switch eShop to display in English? @Gold_Ranger: Nintendo might make that possible, in another update, or e-Shop redesign, if they've haven't taken that into account already. At least being region free if something doesn't hit us we can actually play the physical imports fine, especailly on some of these larger games. I love the 3DS version of the eShop! I'd like to add another little useful trick. Not sure what emails support this but I do know Gmail does. You can add "+something" to your email to make it act like a different email address but what you receive will still show up at your normal email. For example I did [email protected] to set up a Japanese My Nintendo account and later I can do [email protected] for a European account without actually having to set up new email addresses. 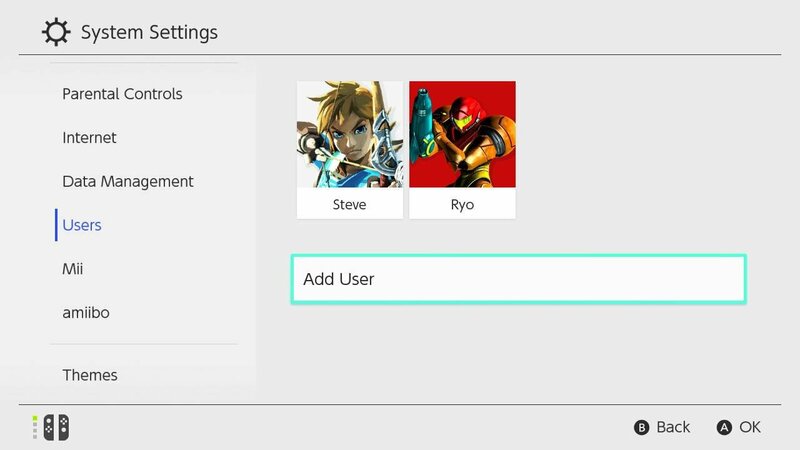 If I create a user profile for the 1st time, can I link it to a Japanese Nintendo Account I already have? Worked like a charm. Thanks now I need to figure out how to add funds. @Metal_Slugger When you ordered eShop Yen cards from playasia did they just send you a code via email? Or did they ship you a physical card? I can't seem to get my US credit card to be accepted though the Japan eShop, is there some setting I need to set in the menu? Or is that just not going to work? @Jim_Purcell emailed the code instantly actually took me to a web page with it on it as well. I didn't even look at my email. I paid through paypal. Question, have you bought any of the Japanese games? Once its downloaded to the Switch, can either profile play the game, or only the one that bought it? I'm looking to get KoF98, just to have something 2 player for pick up games at work. Oh great. I paid for a 1000 yen card, and its currently out of stock! I guess that's why it said 5-15 days shipping, even though its digital goods. So, watch out for that if you're thinking of doing the same. It'll turn up in your email eventually, just not immediately. @Jim_Purcell Yeah I bought one I am pretty sure my US account one was fine, because I played the game right after Zelda so I would of chose that user. Thanks for the guide. I created a JP account and was able to download and play Puyo Puyo Tetris Loving the switch so far! I did this on my Wii U to get to the UK eshop because us Aussies didn't get as many releases as you guys. Just switch between users to get both. How do you like puyo-tetris? Manageable for English users? And what was its yen cost? I am gonna try this as USA user to get on EU eShop. Didn't you guys get NeoGeo at launch? We didn't get poop but retail and a few others. Truly its embarrassing that NOA is the lamest of all N arms. I know it will grow and improve and was just happy to have Fast RMX and Snipclips to buy at at launch alongside Zelda on cart but once again N in USA comes up short with no demos or VC. I hope we do get some demos as I would love to try a 'new' game like Arms before buying it. Dragon Quest Heroes suffers from a poor frame rate though. Thanks for the guide! I got a switch in Hong Kong, even though it's one of the official launch city, there isn't an option to select Hong Kong in the switch startup, but you can select Hong Kong for your account. Unfortunately this means I get no access to any eshop. Thanks for posting this. Made one for myself just in case. I just did this, only took me a little under 10 minutes! I've got the PuyoPuyo Tetris demo downloading right now! @sillygostly I've been playing both demos and didn't notice Tetris was multiplayer. Derp. Thanks for that, will have to investigate further. @Angelic_Lapras_King Considering the First thing they said in the January event was that the Switch is region-free, I'd say so. @mystman12 Can I ask a quick question... Does the games icon still always show on your home screen, even when you choose your regular UK user icon when you first turn your Switch on? Question. I'm from Europe. If I buy a game from the US eshop that hasn't yet been released here - will the games 'merge' when it's released? Or will it be a separate file that I have to buy to own the EU version? I guess I'm asking if there's any cons in buying US games early instead of waiting for EU release. In this case Binding of Isaac Afterbirth+. Hi! I'm trying to purchase Lego City Undercover for the Switch because it already released in America, but not in Europe. I clicked purchase on the game's page, it asked for a zip code. I entered some american zip code I found on the web. BUT now when I want to enter my credit card data, it asks for a zip code again, but that has to be in match with my european card. So how do I purchase the game in this case? @bem5 They merge, apparently. Because when I access the Japanese eShop on my console, all the games I bought on my EU account are marked as "Purchased"! Worked well, but now all of my news is in Japanese, the English is buried. Anyone know how to fix this, beyond just deleting the JP user? @alasdair91 What about credit in the account? @earthinheritor You can't switch accounts if you still have currency in one. @alasdair91 Damn, ah well i appreciate the reply. The eshop deals in Canada are laughably bad but the UK is having a big spring sale but i still have a bunch of credit in my Canadian one. I cannot get either my credit card or my paypal account to link to a japanese account, how is everyone else managing it/paying for games.